The "better burger" company hopes to see better months than August for the rest of the year. "Santa Barbara Style Charburger" source: Habitburger.com. What: Shares of The Habit Restaurants (NASDAQ:HABT), owner of "The Habit Burger" fast-casual restaurant chain, fell 16.1% in August, according to S&P Capital I.Q. data. Most of the company's loss for the month, roughly 12.6%, occurred on August 6th, a day after it released second-quarter 2015 earnings. So What: "The Habit," as the company is more commonly known, actually reported a fairly strong quarter, boasting revenue expansion of nearly 37%, to $56.7 million, versus $41.5 million in Q2 2014. Comparable-store sales posted an impressive increase of 8.9%. But this success was met by disappointment on the part of investors, who have bid up the company and other promising fast-casual peers in hopes of cashing in on their torrid growth. For The Habit, the catalyst for selling appears to have been disappointment in the comparable-store increase. Vigorous as it may have been, the rise marked a decline from the comparable-sales increase of 12.6% recorded in the prior sequential quarter. Now What: Comparable sales, or "comps," will only face more headwinds in Q3 2015. During its earnings call last month, management reminded analysts that, in July 2014, the company won the "Best Tasting Burger in America" award. This drove a surge of new traffic to The Habit locations, resulting in a 16.2% spike in comps in Q3 of 2014. In this quarter, Habit will face comparisons with those results, so investors wanting to see a rebound to double-digit comp growth may be disappointed. HABT P/E Ratio (Forward 1y) data by YCharts. 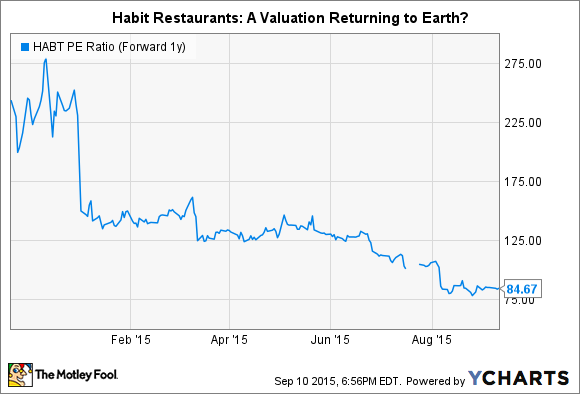 Valuation concerns aside, The Habit is poised to grow. The company plans to double its locations, currently at 117, during the next four years. In addition, management believes that The Habit has the potential to scale to 2,000 domestic locations over the long term. By improving operating margin, which has hovered around 6% recently, and continuing to build out its still tiny presence, The Habit may eventually earn its way to a more reasonable multiple.